Order Peace for your home at Amazon or your favorite book store. Peace for your home by Marie Reed offers a fresh eyes approach for emergency preparedness and offers a guide you can follow along with as you begin or continue in your efforts to live a more stress-free life. By preparing you will be less stressed about the future. 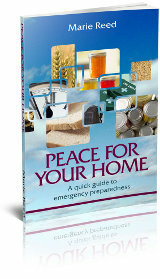 Peace for your home covers: where to start, identifying your needs, meal planning, food substitutions, and provides many miscellaneous tips to help prepare spiritually, mentally, and physically for emergencies. Purchase Peace for your home at Amazon or your favorite book store.